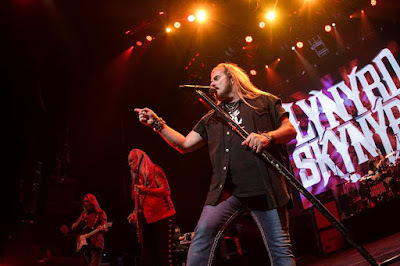 Lynyrd Skynyrd will play the final concert of their Last Of The Street Survivors Farewell Tour at EverBank Field in Jacksonville, FL on September 2. News4JAX reports singer Johnny Van Zant and guitarist Rickey Medlocke announced the event at the venue during the NFL Jacksonville Jaguars' annual ‘State Of The Franchise’ presentation, saying they were both born and raised in Jacksonville and would be proud to play their final concert in their home town. The Southern rock icons will be joined by additional "special guests" at the hometown show. Presale tickets for the Labor Day weekend concert are available starting Tuesday, April 24, with general public seats on sale Monday, April 30 at 10 AM. The Southern rock icons will launch the final leg of the farewell trek in West Palm Beach, FL on May 4. The Last Of The Street Survivors Farewell Tour is named after the Florida group’s 1977 album, “Street Survivors.” Just days after the its release, Lynyrd Skynyrd’s chartered airplane crashed near Gillsburg, MS en route to a show in Baton Rouge, LA, killing the pilot, co-pilot, the group's assistant road-manager and three band members – frontman Ronnie Van Zant, guitarist Steve Gaines and backup singer Cassie Gaines.